After an upgraded 2017.5 model, the 2018 Mazda6 becomes a hot performer with a turbo version of its 2.5 engine. The sportiness inherent in all Mazda products is real, and while the bold-face type and italics are mine, the new Mazda6 has earned them by spiking the previous Mazda6’s personality with a turbocharger to turn the top model with the enhanced 2.5-liter 4-cylinder engine into a sizzling performer. Mazda resisted turbocharging since redesigning its 2.0 and 2.4 with the company’s revolutionary Skyactiv engine concept, which calls for holistic, clean-sheet design incorporating all the latest techniques in harmony to extract every bit of power and fuel-efficiency. The finished product came with a 13-to-1 compression ratio but still burned best with 87 octane regular fuel. When the company’s largest SUV, the CX-9 was redesigned, Mazda, which had dropped its V6 engine, still had to compete with the V6es in comparative Honda, Toyota, Nissan and U.S. vehicles. Easiest way to do that was to turbocharge the 2.5 in the CX-9, and it worked more than just satisfactorily. Mazda technology is unfolding almost too fast, and a totally redesigned Mazda6 is scheduled for sometime in 2019, but meanwhile, the already sleek Mazda6 got a feature and interior upgrade for mid-2017, called the 2017.5 model. The 2018 Mazda6 doesn’t look different at a glance, but to take on competition such as the all-new Honda Accord the latest Nissan Altima and Toyota Camry, Mazda figured to shift the turbo 2.5 from the big SUV into the Mazda6 midsize sedan. 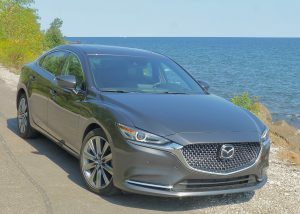 The very classy 2018 Mazda6 Signature model I got for a Labor Day week’s test drive was equipped with the 2.5-liter turbocharged 4, and the turbo’s 225 horsepower and 310 foot-pounds of torque — which would have been impressive for a V6 just a couple of years ago — were startling upgrades from the 184 horses and 185 foot-pounds of the normally aspirated 2.5. 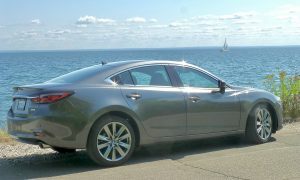 As midsize cars stretch into the larger segment, the Mazda6 displays the class of a luxury car. A footnote to the preferences of U.S. buyers to go after SUVs, pickup trucks, or compact cars, my suspicion is that the sedan category might be streamlining itself in the future, because the newest midsize cars are as big and roomy as large cars have been. And the midsizers outperform their heftier relatives with ease. I love to drive hot cars that might be overpowered but fun, but I also can appreciate the fine engineering of certain high-tech advancements in whatever size. I always was aware the previous 2.5 lacked the sudden jolt of larger engines on initial takeoff, but it also revved easily and readily to real-world levels. So I found the normally aspirated 2.5 more than adequate in the 2017.5 model I reviewed early in the 2018 calendar year. 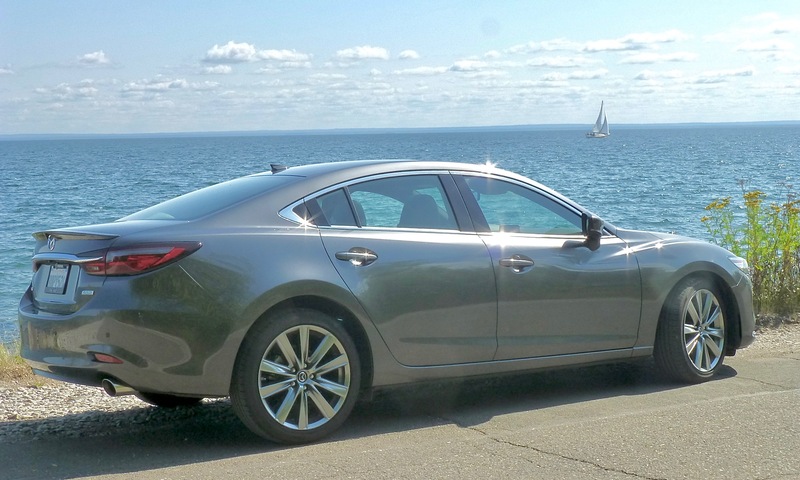 In fact, that one was a stunning red color, so when the new grey Mazda6 appeared — called, boringly, “Machine Gray Metallic” — I was a bit let down, thinking it was just more of the same car. The car looked classy, so classy that I thought it had traded sportiness for class in the exchange. Then I opened the door and saw the deep-chestnut Nappa leather seats and the revised interior. More class, without depicting sportiness. After that, I climbed behind the steering wheel into the well-supported driver’s seat and hit the start button. Shifting into “D,” I hit the gas, and, without question, instead of “Zoom-zoom” I had “ZOOM!” at the touch of my right toe. Comfort and features join in the revised Mazda6 interior appointments. 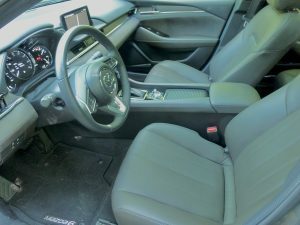 The largest and roomiest of Mazda’s sedans is clearly designed and built to take on the best from Honda, Toyota and Nissan, and even their upscale arms of Acura, Lexus and Infiniti, for zip, and still provide over 30 miles per gallon when you keep your foot off the gas. By Skyactiv tradtion, Mazda engineers go well beyond mere engine power. The new Mazda6 handles with quick-steering and firmed up suspension front and rear, bolstered by stabilizer bars at both ends, and you the little toggle switch on the console is a big benefit if you want to delve deeper into sporty handling. Switching it without even looking, you can alter suspension firmness, the Mazda-built automatic’s shift points, and the quick and precise steering to comfort or sporty choices. I never found the sporty settings to be harsh, and at its sportiest, they do noticeably add performance and handling quickness to the car. Quite amazingly, the tightening of the settings combined with the instant power of the turbocharged engine makes the 2018 Mazda6 perform much more like a sports sedan than a luxury car, despite its classy good looks. Sticker price was $34,750 on the loaded Signature model, with virtually all features standard. Not only does that include about every imaginable comfort and safety feature, it also includes the subtle G-vectoring system, which ingeniously alters power to the outside front drive wheel to create an almost-instinctive inducement when making a sharp turn, resulting in far less need for steering correction. Shifter is joined by a control knob for display features, and a toggle to alter handling levels. There is never any doubt that the focus is on driving precision and astute control, and the features on the Signature model reflect that. Dynamic stability control, traction control, hill-launch assist, and the battery of recent driver/safety aids such as blind-spot monitoring, radar cruise control, rear cross-traffic alert, lane-departure warning, lane-keep assist, the suite of antilock brakes and electronic braking assist, with smart braking assist, are all present and appreciated. Structurally, the Mazda6 feels stronger because of the improved Skyactiv body ring structure, which encircles the occupant compartment with high-strength steel rings, improve the structural rigidity and secure feel that’s relayed through the steering wheel. The LED headlights are bright and feature a precise cutoff, and also have automatic on and off when set to operate it, and are supported by LED taillights and daytime running lights, and adaptive headlights also bend around curves up ahead. Tire-pressure monitors let you know if any tire loses a few pounds of air pressure. 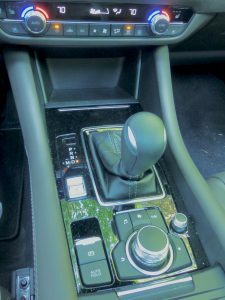 The manual mode on the console-mounted shifter are useful, although the steering-wheel paddles are my choice for manually shifting up or down without taking your hands off the wheel. Great for accelerating, and also excellent for dropping down a couple gears to help slow you descending hills. 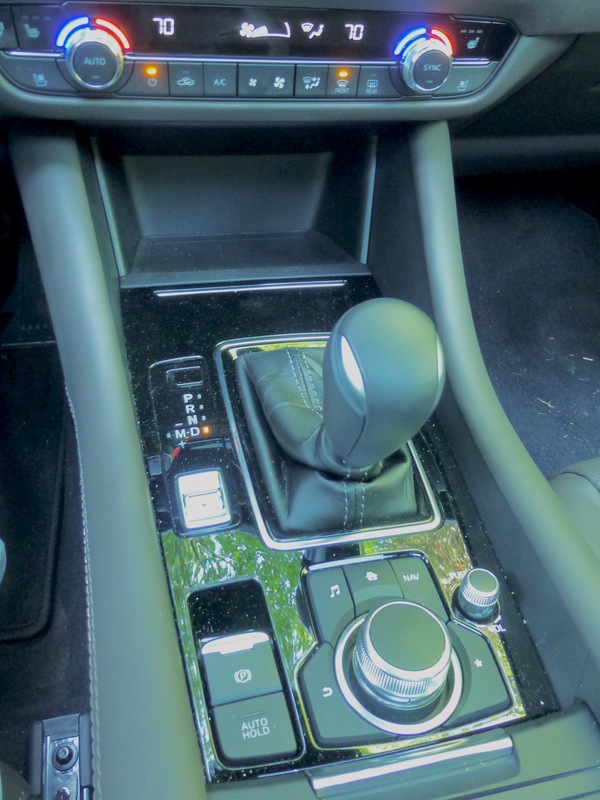 All the latest connectivity items also came on the Signature model, with a navigation system, USB audio, and trip computer all readily spotted on the heads-up display or the 8-inch color touch-screen, and all important controls are remotely operated with steering wheel buttons. 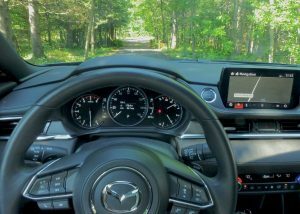 The only place Mazda might have gone overboard is in eliminating its previous simplicity in offering a simple round knob or two to adjust volume and station selection. 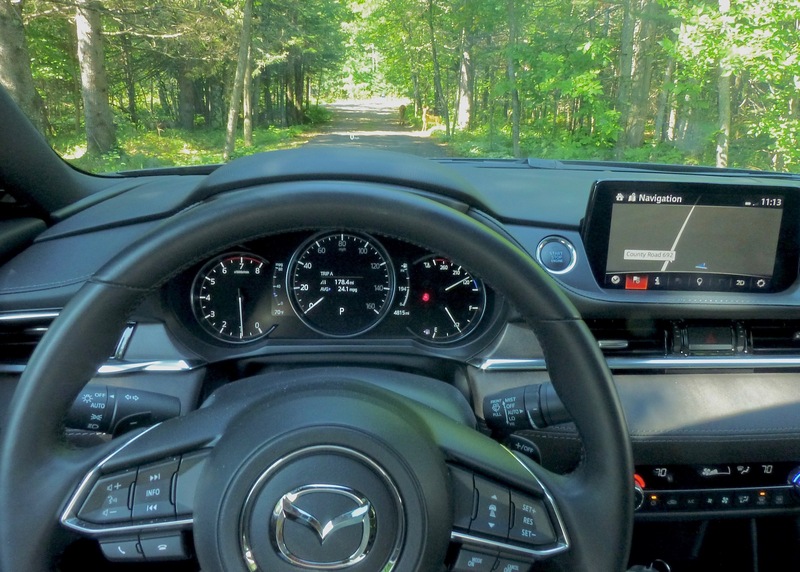 Steering wheel remote switches enhance driving control, and heads-up display helps you spot deer crossing the road. Ventilated and heated front buckets are power operated, with two preset settings. The 19-inch wheels are fitted with all-season tires, and rain-sensing and de-icing wipers are appreciated. When all of those features are combined in one very attractive sedan, the case could be made to find a Mazda dealer and negotiate for the 2018 model. We can assume, based on Mazda’s creative styling studios, that the 2019 will be spectacular. We can wait for whatever surprises Mazda might have coming next year, but for now, all of the latest high-tech features are already out, on the 2018 Mazda6.